For some reason display drivers for both NVIDIA and AMD graphics cards have a tendency to scale image to full panel size instead of keeping the default aspect ratio. 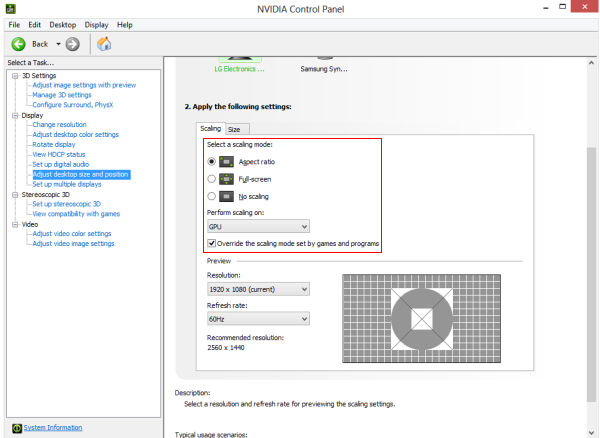 If you don't like to see your image stretched, you can change the behavior in the corresponding control panel (NVIDIA Control Panel or AMD Catalyst Control Center, respectively). The setting also doesn't persist reliably across driver updates, so it needs to be reconfigured occasionally even if it was previously set correctly. The NVIDIA one failed to show most of the settings - only Stereoscopic 3D settings were available in the tree view; nothing else. The AMD one was just reverting the settings to their previous value immediately after applying them. Today I decided to get to the bottom of the issue and finally correctly configure the driver again. It seems NVIDIA Control Panel doesn't play well with other display drivers installed on the machine. Based on this information I tried to disconnect my USB monitor and it helped: all of the configuration options were available again. Obviously NVIDIA drivers don't coexist well with DisplayLink ones, required by the USB monitor. Open Display > Adjust desktop size and position from the tree view. Select the display you want to configure. Set scaling mode to aspect ratio. Set scaling to be performed on GPU. Override the scaling mode set by games and programs. AMD recently released a new generation of their display drivers: AMD Catalyst Omega. 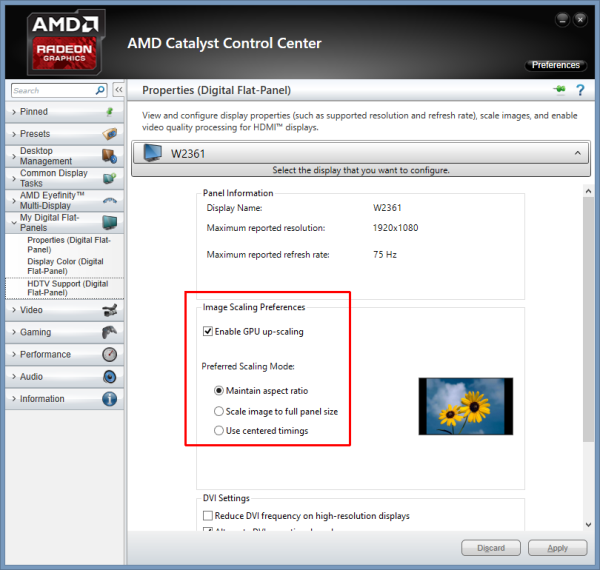 After the upgrade changing the scaling settings in AMD Catalyst Control Center didn't seem to have any effect any more. Fortunately I wasn't the only one having this issue. As suggested in the post, I removed my display adapter from Windows Device Manager, selecting to delete the drivers as well. Select My Digital Flat-Panels > Properties (Digital Flat-Panel) in the navigation pane on the left. Select Maintain aspect ratio as Preferred Scaling Mode.